How far did the Berkeley, Cali­fornia resident go? The car now does a pretty convincing impersonation of a 993 Turbo Cabriolet, a model Por­sche never offered. In fact, prior to the 996-based Turbo Cab­riolet that the company launched in 2004, Porsche officially had only offered a 911 Turbo Cab­riolet from 1987 to 1989. However, Por­sche — being Porsche — has always quietly turned out a few factory specials. Witness the 993 Speedster, a model variant that kind of exists only because Jerry Seinfeld and the late F.A. “Butzi” Porsche wanted one. So while there was never a production 993 Turbo Cabriolet, there was a small batch of 993 Cabriolets that got Turbo bodywork and a turbocharged flat six. “According to Adrian Streather’s Por­sche 993, The Essential Companion, ‘a Porsche dealer from Munich, Germany asked the Exclusive Department to build twelve Turbo Cabriolets,’” explains Mer­vin. According to Streather, the factory ended up building 14 examples. The book also goes on to explain that the 993 Turbo Cabriolets utilized theCIS-injected, single-turbo flat six from the 964 Turbo and produced 360 hp. All of them were based on the rear-wheel-drive 993 chassis, rather than the 993 Turbo’s all-wheel-drive setup. In reality, they were merely turbocharged, drop-top versions of the 993 Carrera and far from the technological wonder that the 993 Turbo coupe was. “I wanted to build the 993 Turbo that Porsche did not make, at least in any significant numbers,” says Mervin. Actually, scratch that: Porsche didn’t sell anything close to the car Mervin would end up building, since his take would have significantly more power and even better handling. It is, for all intents and purposes, a far more authentic take on the concept than even the back-door factory cars were. He couldn’t resist stopping in to take a closer look. An admitted fan of Porsche Cabriolets and convertible sports cars in general, Mervin has owned a 1966 Datsun Roadster, a 1966 Jaguar XK-E roadster, and multiple 911 Targas over the years. At the time, he had a 1958 356A Cabriolet that had been imported from Belgium. He still has the car, which he bought from an elderly woman and restored over time. The 993 that he found himself looking over at the Kia dealer looked like a bargain. “It was in clean, used shape, and it had never been in an accident,” he says. Its paint had faded a bit, its body had a few dings, and its once-beautiful wheels had seen better days, but the Por­sche ran great. The only obstacle was convincing his wife, Nan, that the 993 was a smart purchase — a task he tackled as soon as he flew home. “I had young children at the time, and convinced my wife that it was plenty big enough for the kids and her too…” begins Mervin. “I neglected to mention that the kids might have to forgo circulation in their legs while riding in the back, but hey, whatever it takes.” In the end, he managed to convince her the modern, ostensibly four-seat Porsche was the perfect family car. A few days later, Mervin flew back to Oregon and drove the 993 home. While his wife chuckled good-naturedly when she saw the sorry excuse for a back seat all 911s are known for, Mervin couldn’t have been happier with his acquisition. “Having owned many 356s, 912s, and 911s, the 993 represents the pinnacle of the air-cooled 911,” he says. “The power, braking, multi-link — as opposed to torsion-bar and trailing-arm — rear suspension… (it) has a powerful, refined, and well-engineered feel.” On a side note, Mervin even tried to find a rare factory Por­sche baby seat, but was ultimately unsuccessful. This might be the end of the story for most. But, you know, boy meets car, boy and car live happily ever after — it was really only the beginning of a new chapter for Mervin and his 993 Cabriolet. “I suffer from Upgrade-itis,” he admits. “If some is good, more is better. And more is never enough.” Compound­ing his hard-to-treat affliction, Mervin became aware of the aforementioned rare factory special shortly after he bought the 993. He also liked the 993 Turbo coupe, so he decided to create the best of both worlds. Researching shops that could handle the work led him to TurboKraft in Mesa, Arizona. A phone call to shop owner Chris Carroll led to the conclusion that transplanting a real 993 Turbo engine was a better move than turbocharging the existing, naturally-aspirated 3.6. Not long after, a 993 Turbo engine, complete with wiring harness and engine control unit, were sourced from LA?Dismantler in SoCal. Carroll opened the motor and found that the internals were still in fine enough shape to use without a rebuild, so the pistons were simply de-carboned before the case was buttoned up. The cylinder heads, on the other hand, were rebuilt with new guides and oversize exhaust valves. In the quest for more power, the stock K16 turbo­­chargers that Porsche originally specified were remanufactured and fitted with the larger compressor wheels from K24 units. The factory Turbo mufflers were then modified for improved airflow as well as a louder exhaust note. These terminate in stainless-steel Dansk Sport exhaust tips. When the engine was purchased, it came with a modified ECU, which helped the refreshed engine produce a claimed 385 hp and 426 lb-ft of torque at the wheels. “This is approximately 450 horsepower and 500 pound-feet at the flywheel — stronger than a 993 Turbo and comparable to a street 993 GT2,” says Carroll. This 993 retains its original six-speed transmission rather than the G64/51 unit used in the 993 Turbo. “Since Turbo gearboxes are rare and expensive, with longer gearing more suitable for the autobahn than street driving, the decision to retain the shorter C4 transmission was a clear one,” explains Carroll. “It results in a car that’s more fun to drive on the hilly, narrow roads of Northern California. There’s one hitch, though: “The Turbo six-speed is nearly an inch longer than the non-Turbo transmission,” notes Carroll. “This positions the engine farther back in the chassis, and all of the engine peripherals (such as) the air-guide sheetmetal, motor mount, intake plenum and tubes, intercooler and air guide, (and) exhaust tips are designed to fit in this aft position.” Carroll says you can run into interference and serious serviceability problems if the 993 Turbo engine is merely installed in the same spot as a naturally-aspirated 3.6. To position the twin-turbocharged flat six in the same place it would be in a 993 Turbo, an engine-and-clutch spacer was engineered and fabricated. Carroll also installed what he calls an “RS Touring flywheel,” which is a bit heavier than a 993 RS flywheel to keep the engine from stalling at idle but far lighter than the C4’s original dual-mass flywheel. A 993 Turbo clutch assembly was used with the accompanying hydraulics, including the power-steering pump, reservoir, lines, and slave cylinder. With more power came more motivation to improve the rest of the car’s performance, particularly in regards to the braking and handling. To that end, a set of Bilstein PSS-9 coil-­overs and a front strut brace were added. Adjustable rear toe-links were installed to ensure that the car could be correctly aligned when lowered. 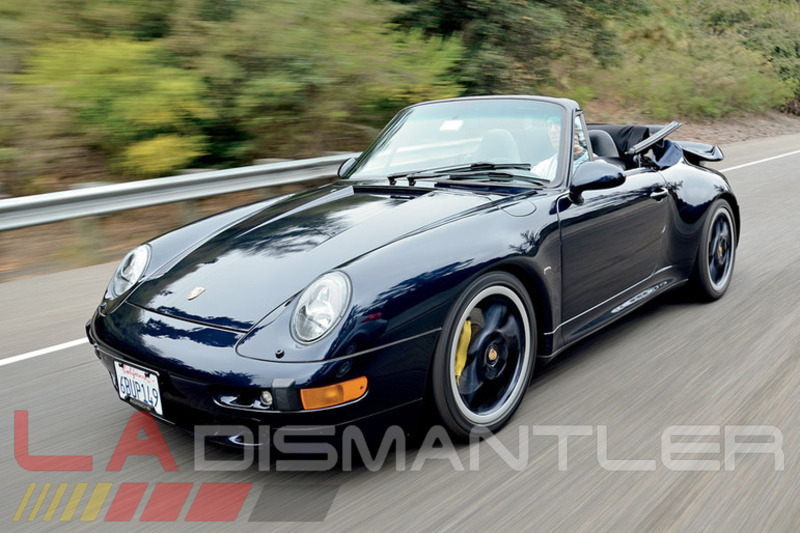 Once the car was delivered back to Mer­vin’s home in the Berkeley hills, it was handed over to S-Car-Go in nearby San Rafael, where factory 993 Turbo brakes were installed to allow the Porsche to stop as well as it accelerated. With a driveline that was now approximating that of a 993 Turbo, the last piece of the puzzle was making the car look like one. Mervin got lucky when he found a set of OEM bumpers and inner bodywork being sold by a Canadian racer who was installing more radical bodywork on his 993 race car. The top edge of the quarter panels were carefully reworked and massaged to allow the bottom edge of the soft top to fit properly for a factory look. “I spent a lot of time scouring factory manuals and parts diagrams to determine just what was different about the Turbo,” recalls Mervin. “It was a lot of work for a fairly subtle change to the exterior.” The finished body was painted Midnight Blue, the car’s original color. The “illusion of factory” is completed by a set of 18-inch, hollow-spoke Turbo wheels wrapped in sticky 225/40R18 and 285/30R18 Michelin tires. The result of all the work that went into this 993 is stunning. In person, it looks factory fresh — as if Porsche just rolled it off the assembly line. Swing­ing the door open for a drive reveals the fact that Mervin didn’t neglect the interior, either. 993 hardback sport seats with Midnight Blue backs and black leather surfaces were installed. Con­tinuing the theme, the rest of the interior was liberally swathed in black leather supplied by Autos International, which also provided the carpeting. The center console matches the exterior, while a three-spoke 996 GT2 steering wheel was installed. When Mervin acquired the 993, it came with a rare Root Wood shifter, which I grasp as I reach for the ignition key. The twin-turbo 3.6 wakes up with a hollow whir. Despite the modified mufflers, the powerful flat six sounds surprisingly civilized. Clutch effort is considerable and, with a lightened flywheel, moving away from a stop smoothly takes a little practice. Once underway, though, any niggling complaints about the clutch fade quickly. The six-speed manual is a joy to operate, with relatively short throws and a light, positive action. Down a straight road, this Cabriolet positively bolts for the horizon. The acceleration becomes considerably stronger around 3000 rpm. By 4000 rpm, the car is lunging ahead, pushed inexorably down the road by those deep-breathing hybrid turbochargers. It’s the kind of power that pushes you firmly back in your seat, if not quite pinning you to the leather. Into third and then fourth gear, it doesn’t take long to get well into triple digits. Lift off the throttle for a corner, and the exhaust pops and bangs fantastically on the overrun. Over bumps and dips, the front end goes light in typical 911 fashion, with the steering wheel writhing in my hands as the front tires hunt for traction. Commit to a corner and you’ll find the car to be fantastically grippy thanks to its all-wheel-drive, compliant coil-overs, and fat tires. While the feedback delivered by the 993’s chassis is neither as fine nor as generous as a 996 Turbo’s, there is enough information coming in through the wheel and the seat of the pants to know what the tires are up to. There is an occasional rattle from the doors and the body, a reminder that Por­sche has come a long way in the last 18 years when it comes to the rigidity of its convertibles. Overall, though, this is an incredibly stable, solid 911. It also feels surprisingly compact on these roads, a sensation gone missing in the latest 911s. » Porsche blogger Needed! Email us if you are interested!